What is the best Toto Washlet to get?! Home Articles What is the best Toto Washlet to get?! Toto is arguably the leader when it comes to bidet seats. They were the inventors, after all, and their Washlets are truly amazing products. 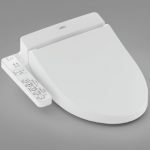 “Washlet” is the trademark name of Toto’s electric toilet seat with water spray function. 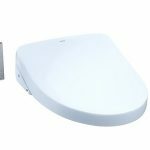 These toilet seats can be installed on a regular toilet, which allows you to add a bidet to your existing toilet with minimal effort. If you’re shopping for a Washlet and don’t know which one to get, this guide is for you. We’re going to take a look at the different Washlets available and compare their prices and features so that you can choose the Washlet that best suits you. Do you want a basic bidet with spray and heated seat only? Do you want advanced features such as deodorizer, night light, or automatic open/close lid? Toto currently has these models of Washlets for sale: A100, A200, C100, C200, S300e, S350e, S500e, and S550e. We consider the A100 and A200 to be basic bidet seats. A step up would be the C100 and C200 bidet seats, which have a few more features. And the S300e, S350e, S500e, and S550e are what we consider luxury bidet seats – the ones that have all the advanced features. 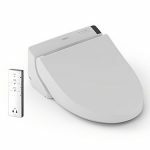 If you want a bidet seat with just a spray and heated seat, the A100 and A200 are the Toto Washlet seats for you. The A100 (MSRP: $499) comes with a control panel attached to the seat, while the A200 (MSRP: $599) comes with a remote control. The C100 and C200 are the most popular Toto Washlet seats because they balance price and function. 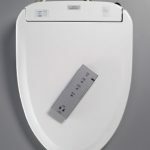 Besides the spray and heated seat, the “C” series comes with a warm air dryer and some handy features to keep the toilet clean, such as a deodorizer and a toilet bowl “mist” spray that shoots out water before use so that dirt doesn’t stick to the bowl. The C100 (MSRP: $599) comes with an attached control panel, while the C200 (MSRP: $699) comes with a remote control. And finally, the S300e (MSRP: $1,404), S350e (MSRP: $1,560), S500e (MSRP: $1,499), and S550e (MSRP: $1,650) are the Toto Washlet seats that have all the bells and whistles. With regards to the appearance, the S300e and the S350e are identical. The same is true for the S500e and S550e. You can actually get the S500e and S550e in two different designs: Classic or Contemporary. 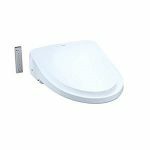 In other words, you can get the S500e bidet seat in Classic or Contemporary design, and likewise you can get the S550e bidet seat in Classic or Contemporary design. All four of these Washlets have an attractive slim design. The S500e and S550e are only available in an elongated version, whereas the S300e and S350e are available in both elongated and round versions. With regards to function, the S300e and the S500e are identical. Their main features are spray, heated seats, air dryer, deodorizer, and electrolyzed water sanitation. The S350e and S550e have all these features plus a night light and automatic open and close lid. We consider all four bidets to be advanced bidets, but the two that have all the features imaginable for a bidet seat are the S350e and the S550e. The S500e and S550e were released a few years later than the S300e and S350e, so they have a more “updated” look and remote control. But the differences are minimal. To summarize what we’ve said so far, the A100 and A200 Washlets are your basic bidets, the C100 and C200 are your mid-range bidets, and the S300e, S350e, S500e, and S550e are your luxury bidets (especially the S350e and S550e). If you would like a thorough review of each of the bidets, please read our Toto Washlet reviews or take a look at some of our direct comparisons: Toto A100 vs. Toto C100, Toto C100 vs. Toto C200, and Toto S300e vs. Toto S350e. If you have any questions about the bidet seats, please ask in the comments below and we’ll do our best to answer them for you. Considering all the models, our favorite Toto Washlets are the C100 and the S550e. The C100 would be the one we recommend for the average household. In our view, it doesn’t really make sense to get the basic models A100 or A200. One reason is because the A200 is essentially the same price as the C100, but with the C100, you would get some extra features like the warm air dryer and deodorizer. For those looking for the ultimate experience, the S550e would be the one we recommend, especially if you have an elongated toilet. 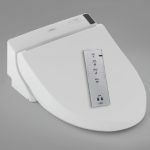 It is one of the newest bidet seats that has all the features ever imagined up for an electric bidet seat. If you have a round toilet, then go for the S350e. 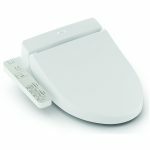 The S350e is one of the slimmest advanced bidet seats that we have ever seen.